In case you were wondering about it, yes, reindeers are totally real! These regal creatures are typically associated with Christmas, flying and Santa Claus, but are far from being just mystical creatures. 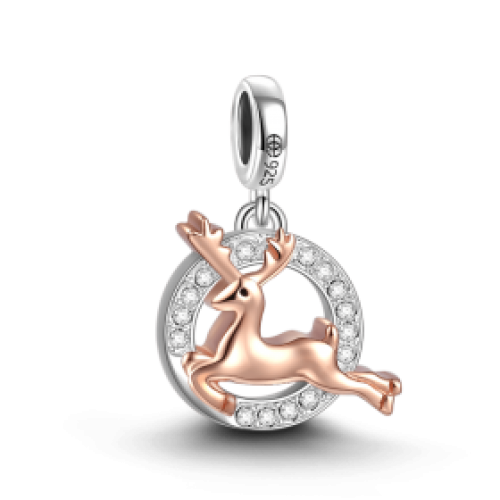 If you are a fan of unique charm beads, or love animals, then be sure to take a peek at our Christmas Reindeer bracelet charm. This elegant, dangle charm is lovely and versatile. It features a shimmering, crystal-studded circle with a leaping reindeer in the middle of it. To really show off your holiday spirit, why not mix and match this sterling silver bead with everything from candy cane charms and Santa charms, to North Pole charms and gift charms? You will be spreading Christmas cheer everywhere you go!